Cloud storage is a revolution in the internet where we can pile up large amounts of our data with no trouble. But when sending and receiving large file through email, the cloud storage giants Dropbox and Google Drive can pose issues sometimes. And when we want to send files to someone quickly, email is a far better option compared to Google Drive and other services. Moreover, we can’t mail large files as ISPs enforces with strict file upload limit. That’s why we have compression tools for reducing file size without losing your significant data. 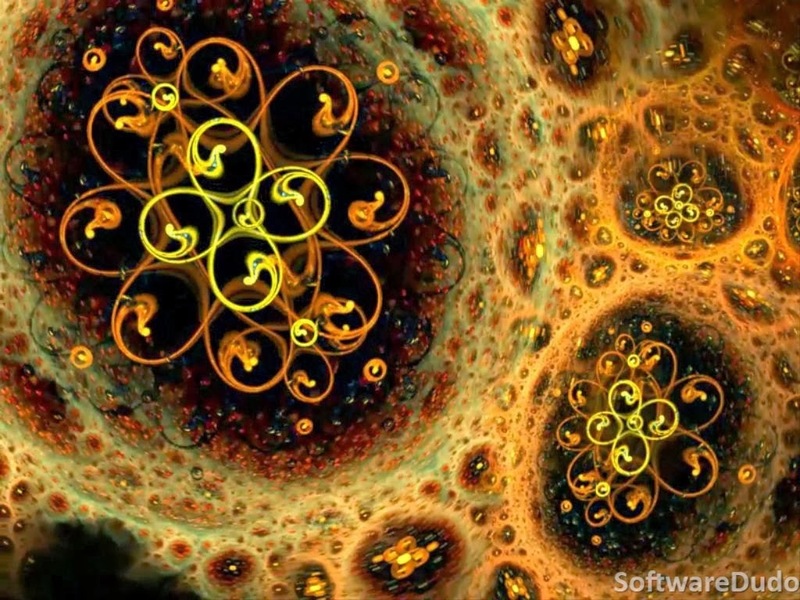 The compression softwares will include strong techniques for shrinking the file size effectively regardless of their size. Besides, the risk of losing your important data is zero. So, from any perspective these tools will get your job done without difficulty. 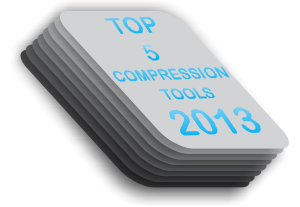 The popular compression applications such as WinRAR or WinZip are commercial, but worth buying them. If not, you can dig up free alternatives out in the market which are free and open source that perform almost the same task as WinRAR or WinZip, but with different compression techniques. I’ve listed some free alternatives for the paid compression applications. Let’s see them briefly. 7-Zip is an open-source application with GNU LGPL license featuring a high compression ratio with LZMA and LZMA2 compression. It is regarded as the best free alternative to WinRAR and other commercial applications despite its not-so-attractive interface. 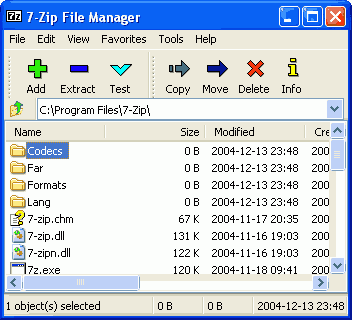 7-Zip includes its own compression format 7z along with other formats such as .ZIP, .TAR, .XZ, .BZIP2, GZIP2, WIM, CAB, FAT, and many more. The compression ratio is 2-10% better than WinZip and PKZip. A strong AES-256 encryption is followed in 7z and ZIP formats with self-extracting capability for 7z format. It integrates with Windows Shell together with a powerful file manager and a command line version. IZArc is a free file compression utility supporting huge list of archive formats compared to other free compression tools. The interface is easy-to-use and fresh with drag-and-drop facility from Windows Explorer. You can create multiple archives spanning disks, self-extracting archives, repair damaged zip archives, convert one archive type to another, view and write comments and many more. With IZArc, you can open CD image files like ISO, BIN, CDI and NRG. When you open archives, it checks for viruses using Anti-Virus scanner. Your files are archived using 256-bit AES encryption which can also be performed faster using the Windows Explorer menu integrated into Windows. 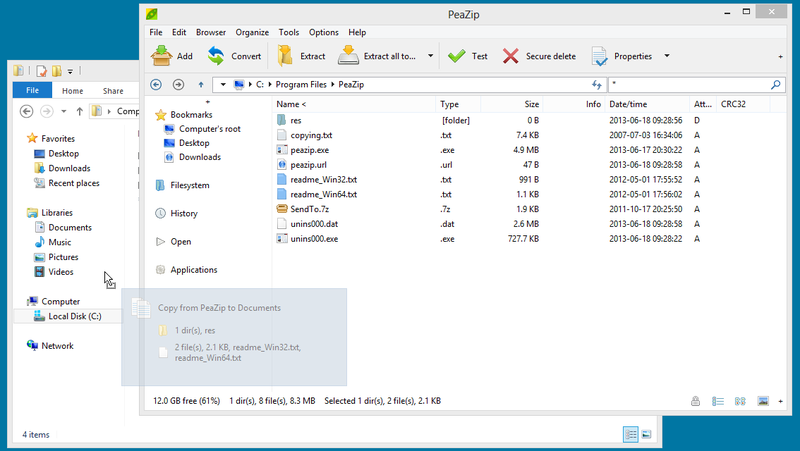 PeaZip is a free zip files utility and free Rar files extractor to perform file compression, conversion, split, encryption, secure data deletion. Over 150+ formats are supported. The user interface is modern with drag & drop facility, context menu integration, and high compression ratio. PeaZip includes features strong encryption, two factor authentication, encrypted password manager and secure deletion to safeguard the privacy of your data. It can also find duplicates, backup saved scripts, split and join files and much more. It is free and open-source application. You can download 32-bit, 64-bit, portable and Linux versions for free from its official site. This is a very powerful Zip Archiver from Hamster which supports ZIP, WinZip, 7zip, WinRAR and other compression formats. Hamster Free Zip Archiver gets fewer points over other archivers with its new enhanced zip algorithm for compression, which cuts down the time required to create an archive with more than 2-fold. It has full multi-core processor support with full integration with Windows operating system. The multi-core processor has high speed with optimum compression and productivity settings over others. It has the most comfortable settings for users to use email, Rapidshare, CD, DVD, etc. A free WinZip alternative with new 2013 Black Hole 10X compression technology, ZipItFree archives your files with higher compression ratio. You can create, open and extract zip, rar, Gzip, BZip, Cab, Jar, Lha, Tar, Tar Bzip, Tar Gzip, and other formats. You can zip your files and e-mail it with just a single click. It can protect your important files with a password. It has ZIP2.0 high secure AES encryption along with multiple archive integrity verification. The user interface is flexible where you can even comment your ZIP archives. You can even split large zip files through “Split Archive” feature. Apart from the above free compression tools, there are some utilities like Universal Extractor which can extract any archive that can be useful sometimes when you don’t know what type of archive format is received through email. Finally, the free compression tools holds strong when you consider excellent features such as secure deletion, strong encryption, and splitting archives which are present only in paid compression tools. For complete media playback and conversion, you need to have a set of codecs installed in your PC. 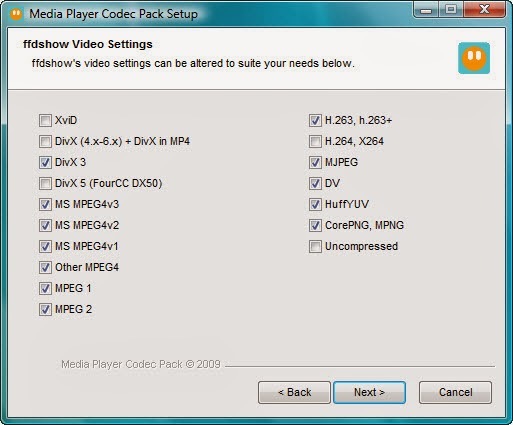 Most media players include all compression and file types, the codec pack is essential when encoding and/or decoding video or audio data from files, streams and broadcasts. When Windows Media Player is concerned, it doesn’t have enough video and audio file formats and compression types needed to play every media file. That is when Media Player Codec Pack comes into act. “Media Player Codec Pack” is one of the most popular and effective codec package which supports almost every compression and file type used by current video and audio files. You don’t require any additional software to play with any multimedia file. The package offers advanced settings for experts to customize accordingly. 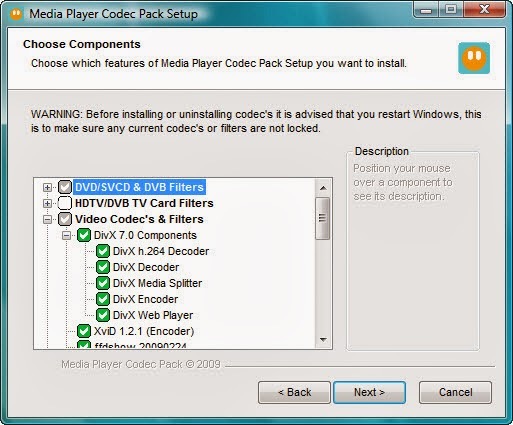 Media Player Codec Pack offers two types of installation options – Easy and Expert (Detailed). It is recommended to choose ‘Detailed’ installation as ‘Easy’ one will install third-party applications. It empowers you to select components that are to be deployed on your computer. Media Player Codec Pack 4.2.9 is the newest version which has minor updates to its release such as updated DXVA & Intel Quick Sync GPU/graphics card database, ffdshow, LAV filters, AC3filter, Haali splitter, xy-VSFilter, CDXA Reader and their x64 versions to the latest ones. The latest version is compatible with Windows 8, 7, XP, Vista, 2000, 2003, and 2008, whereas you need to have Microsoft Windows Media Player 9 or above and any multimedia player with DirectShow compatible. MP4, MPEG2, MPEG4, AVC, DivX, XviD, x264, 10bit x264, h.264, and many more. Bluray (Protected) | AVCHD | HD-DVD | DVD | CD | .mkv | .avi | .flv | .webm | .mp4 | .ts | .m4v | .m4a | .ogm | .ac3 | .dts | .flac | .ape | .aac | .ogg | .ofr | .mpc | .3gp and many more. The package identifies the best proof tested settings with supplementary options for CPU, GPU, and DXVA compatibility. During installation, users are allowed to set audio output from basic 2.2 stereo to 7.1 channel output. As far as media formats are concerned, the protected formats may require a specific media player for playback. If you are a fan of Windows Media Player and wants to play every media file on it, Media Player Codec Pack is a must-have codec collection that does its job exceedingly well. You can download the latest version of Media Player Code Pack for free which is about just 24MB size. To ensure smooth operation, computers require maintenance at regular intervals and you need a strong management and optimization tool. Ashampoo WinOptimizer 10 is a computer maintenance and virtual technician to optimize and protect your PC. It aims at increasing your computer performance with its useful tools that will make your PC like a brand new one. It makes your PC faster and more receptive, protects your private data, cleans unwanted files/entries, fix common Windows errors, improves system stability, and accomplish high performance. Ashampoo WinOptimizer 10 is designed and developed by a German-based computer software company called Ashampoo GmbH & Co. KG. The company is best known for Ashampoo Burning Studio, one of the best burning tools available in the market. Ashampoo was founded by Rolf Hilchner in 1999. The newest version Ashampoo WinOptimizer 10.3 has few enhancements such as Improved Windows 8.1 support, Improved Opera 17 support, New arrange function for safe cookies, and fixed some trivial problems. It has also added a new Halloween skin for the interface. A 40-day trial version is available for download, where you have to register via email after the first 10 days are completed. To run this program, you need to have full administrative rights on your computer. Redesigned User Interface with maximum ease of use with user-defined favorites. Enhanced Windows 8/8.1 support for maximum compatibility. Ashampoo WinOptimizer 10’s user interface is user-friendly with five important sections which include Overview, Modules, Favorites, Backups and Statistics. The ‘Overview’ section provides a single-click fix button – “Fix now” for cleaning, optimizing and protecting your PC, with the number of issues found. In ‘Modules’ section, there are categories and functions for maintaining, improving performance, customizing windows, analyzing system, and other general tools. In ‘Favorites’ section, the frequently used modules are automatically listed by the system, where you can add/remove favorites. 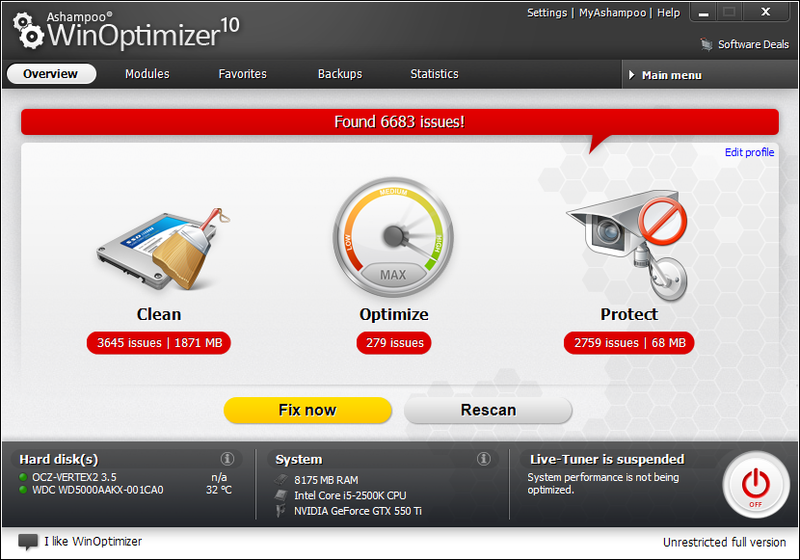 Ashampoo WinOptimizer 10 has six tools for analyzing your system. You can retrieve detailed information on your PC’s software and hardware specs via “System Information” tool. The “Disk Space Explorer” analyzes your hard disk space for errors. You can also analyze your hard disk’s S.M.A.R.T. data and conclude the health status and its reliability. You can measure machine’s performance and compare with others through “System Benchmark” and you could detect defective files on your hard disk and recover them using “Disk Doctor” tools. The “Font Manager” removes installed system fonts. There are five management tools for improving your system’s performance without disturbing your regular work – Service Manager, Startup Tuner, Internet Tuner, Process Manager, and Uninstall Manager. System Maintenance Tools - One-Click Optimizer, Drive Cleaner, Registry Optimizer, Internet Cleaner, Defrag 3, and Registry Defrag. The defragmenting tool runs at its full potential only if there is enough disk space available. Windows Customization Tools – Tweaking, Anti-Spy, File Associator, Context Menu Manager, and Icon Saver. Finally, Ashampoo WinOptimizer 10 is definitely worth trying if you are searching for strong system maintenance and optimizing tool. You can purchase the full version license for $39.99 gives you unlimited maintenance and protection or upgrade your existing Ashampoo WinOptimizer to the latest for just $11.99. Ranks at #2 in media players, GOM Media Player is capable of fulfilling all your playback needs with built-in media codec support, advanced features, Codec Finder service, and extreme customizability. 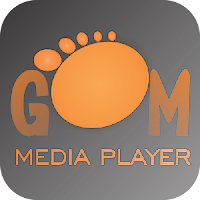 GOM Media Player is absolutely a free audio and video player to download and use. It supports a wide range of file formats such as AVI, DAT, DivX, WMV, ASF, MPEG and lot more. The pain of finding and installing separate codecs is gone with built-in codec and Codec Finder services. You can even play incomplete or damaged video files/locked or partially downloaded files with GOM Media Player. GOM Media Player (Gretech Online Movie Player) installs on the latest Windows 8 and its predecessors. It is developed by South Korean company called Gretech Corporation, with the initial release happened to be on January 7, 2003. It supports popular languages such as English, Russian, Korean, Japanese, and Chinese. GOM Media Player is freeware and ad-supported. [Improved] File Associations window for Windows 8 and other miscellaneous corrections and fixes. The installation is customary with an optional setup process to optimize the initial use based on sound and monitor setup. The default window size would be 4:3 with an orange, black, and silver, that looks like a Halloween theme. The playback tools are situated on the bottom left corner, and control panels for organizing your media content are located on the contrary side. You have an optional integrated upsell ticked for linking users to any GOM’s products or video content, which can be removed easily by changing to another skin. You can set custom hot keys and synchronize remote iOS and Android devices to control the media player over Wi-Fi. GOM Media Player adjusts accordingly and tweaks your picture settings incrementally during live play. Supports different media formats such as AVI, MPEG, MPG, DAT, WMV, ASF, ASX, DVD and other popular file formats. Codec Finder – GOM media player will automatically find the right codec for your videos and download them without requiring you to install separate codecs. Play Damaged AVI Files – Has the ability to play AVI files that have broken index or if it’s not completely downloaded. Great Subtitle Support – GOM player supports SRT, SUB, RT, SMI files for subtitle, where you can customize the location, size, resolution, font, margin, and others. Own Multimedia Playlist – You can create your own convenient playlist as M3U, PLS, ASX formats, as well as import/edit different media formats on that playlist. Burst Capture feature – You can take continuous screenshots up to 999 shots of your video directly from GOM Player. AVG Internet Security 2014, the latest edition of internet security tool from AVG (Anti-Virus Guard) offers best virus protection with its new identity features to protect your personal data. It is an award-winning antivirus which safeguards your privacy by detecting and removing viruses & spyware without compromising PC’s performance. It provides multi-layered protection for online browsing and transactions. The latest threat information is collected using AVG’s Protective Cloud Technology and Community Protection Network, where you could browse and download stuff from internet without worries. AVG Internet Security 2014 works beyond simply removing viruses on your PC by chunking infected links when you browse, checking files before you download, and aiding protect your personal data from hackers and other intruders. 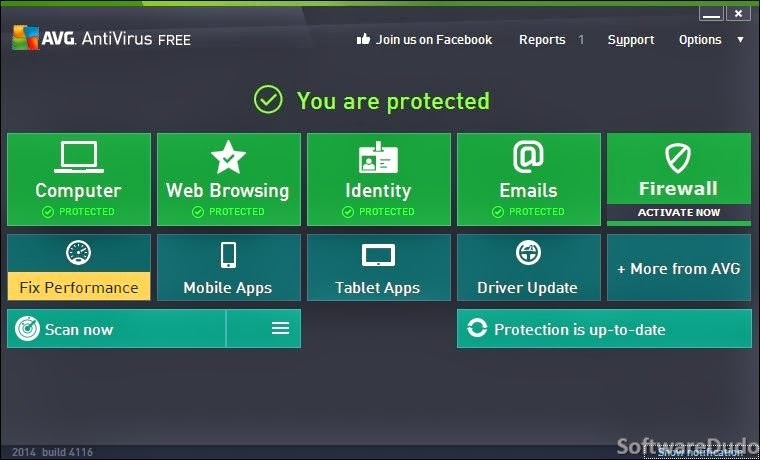 Not only protection, AVG’s new internet security tool also ensures your PC’s performance doesn’t go down by reducing scan times, stopping notifications while you are working. The latest version – AVG Internet Security 2014.0.4259 has minor improvements and fixes from last version such as Modified Identity Protection Components’ dialog, added “Fix it” button if E-mail Scanner is not completely functional, fixed problem with accidental BSOD caused by “avgwfp” driver, fixed E-mail scanner certification is now correctly updated after virus database update, fixed possible false positive detection, etc. A 30-day free trial is available for download on AVG’s official website, where you can purchase the full version for $43.99 or 1299.00 INR. You can purchase for 1 yr or 2 yr subscription according to the number of PCs you have. You can also download other AVG security products such as AVG PC TuneUp, AVG PrivacyFix, etc. AVG Internet Security 2014 works more on streamlined security experience adopting and renovating the modern UI movement. As the tool is fully compatible with the Windows 8 operating system, the UI is also touch compatible and looks similar to “Metro” design. The main interface shows you the current status of the computer, web browsing, identity, emails, and firewall. The “Fix Performance” button can repair most of the computer’s performance issues such as registry errors, junk files, fragmentation, broken shortcuts, etc. easily. You get four Scan Options for inspecting the computer which includes Manage scheduled scans, Scan whole computer, Scan specific files or folders, and Scan computer for rootkits. The installation still offers a security toolbar which does include useful security options like Do Not Track, which is also available as a standalone version for free on Firefox and Google Chrome. So, you can download the extension from their respective stores instead of installing the toolbar. 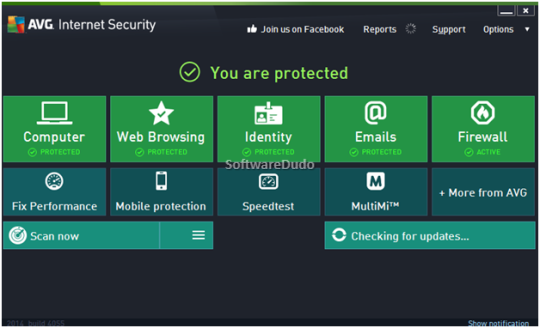 AVG Resident Shield – Blocks malware and anything that’s infected on your PC. Email Scanner – Works as a plug-in for email applications such as Microsoft Outlook 2010, POP3, SMTP, and IMAP accounts. LinkScanner Surf-Shield – Stops you from browsing infected or criminal sites using Smart prevention technology. It checks every web page before you click and blocks it right away. Proactive Cloud Technology – Installs automatic updates via “the cloud” and prevents emerging threats. Anti-Spam – Stops spammers and scammers from infecting your PC by checking all your emails for malicious content and code. Advanced Online Shield – Checks files that are safe to download and ensures a safe exchange of files using MSN and Yahoo! and ICQ. File Shredder – Deletes your personal data permanently on your hard disk that might be vulnerable to someone else. Encrypted Data Safe - Stores all your significant and valuable documents, photos, videos and other files into a password-protected virtual disk on your PC by encrypting them. With purchased AVG IS 2014, you can have as many Data Safes as you wish to. Do Not Track – Comes with AVG Security Toolbar which identifies which websites are tracking i.e. collecting data on your online activities and allows only after your authorization. It works as a plug-in for Firefox, Chrome and IE. Wi-Fi Guard – Blocks unknown and suspicious wireless network points, especially access points used by hackers and alerts you before you connect. Enhanced Firewall – Provides you the ultimate protection for your personal information such as credit card numbers, bank details, online shopping and other online activities by preventing hackers (malware) from accessing your private data. Faster Performance – Offers rapid scanning using ‘AVG Turbo Scan’ and works on low priority mode using ‘AVG Smart Scanner’ to make sure your PC doesn’t get slowed down. Apart from the above features, AVG Internet Security 2014 also fixes performance issues related to your PC via AVG Advisor, AVG Auto-Fix and Auto-Updates. You get the ultimate video-viewing experience via AVG Accelerator, maximizing connection speeds and deliver faster and smoother video streaming on sites like YouTube. You also get a 24x7 free phone support, 365 days a year. After 30-day trial period you should buy the full version to get unlimited protection. Coming to the performance, the detection rates are improved and the scanning speeds are rapid. The privacy tools are robust detecting malware efficiently than before. 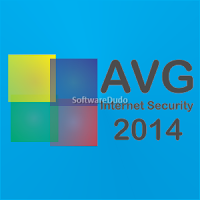 For those who actively share their machine with other users, AVG Internet Security 2014 will be most useful. Wise Program Uninstaller is a reliable uninstall tool from “WiseCleaner”, which helps you to safely remove programs from your PC, without modifying the system efficiency. It can remove the residual entries of the uninstall program, where there are certain leftovers after you uninstall a program. It is free to download and supports Windows 8 operating system (both 32 and 64-bit). The leftovers are not completed removed when you use the default Windows uninstaller program. Wise Program Uninstaller is very much handy in these situations. The simple yet elegant user interface is easy to use. The newest version has improved reading installation time of applications, added Auto-checking function for updates, updated language package and fixed the problem of not identifying some installation directory when using Forced Uninstall. Offers additional features compared to the default Windows ‘Add or Remove Programs’ function. Clean and clutter-free User Interface. Safe Uninstall mode – Performs the normal installation with basic functionality. Forced Uninstall mode (only experienced users) – Removes all related data like registry entries without affecting your system performance or stability. Repair programs which have issues. Automatically shows when starting Wise Program Uninstaller. Displays detailed information of all installed apps or programs on your system such as name, publisher, size, installation date and version. Built-in Search function to quickly search a specific item. The Forced Uninstall mode removes the program, its related files as well as Windows registry entries. Removing registry entries is not a safe measure as Windows may start experiencing errors. So, it is recommended only for experienced users. Finally, Wise Program Uninstaller performs uninstall task utilizing low CPU and system memory. You can also download Wise Program Uninstaller 1.57 portable version for free. It’s easy to download and update regular softwares like antivirus, editing tools, etc. but when it comes to PC drivers, the task is quite complex. You have to search for the latest updates of the drivers from its internet, download them and update them. If the downloaded updates are corrupted or missing, then you can’t restore the original drivers of yours. That’s when you need to have a powerful utility like ‘DriverMax’ to perform all the required tasks quickly and effectively. DriverMax is an excellent Windows PC utility tool to download the new updates of your Windows drivers and update them easily without needing any additional programs. It backs up all your drivers installed on your PC, so that you can restore when required. It automatically checks for new driver versions in your computer and installs missing drivers for unknown devices as well. The newest version of DriverMax 7.23 identifies for fresh updates of your PC drivers and downloads the latest drivers faster than ever. It spots out the unknown devices and get Vista rating information before your buy new hardware. You need only 10 MB of free hard disk space and internet connection for free registration. You can create an account to access the program’s functions via the built-in User Registration Wizard. The only constraint from DriverMax is it downloads only 2 drivers per day for free users. Download, Update, Backup and Restore the drivers installed on your PC. 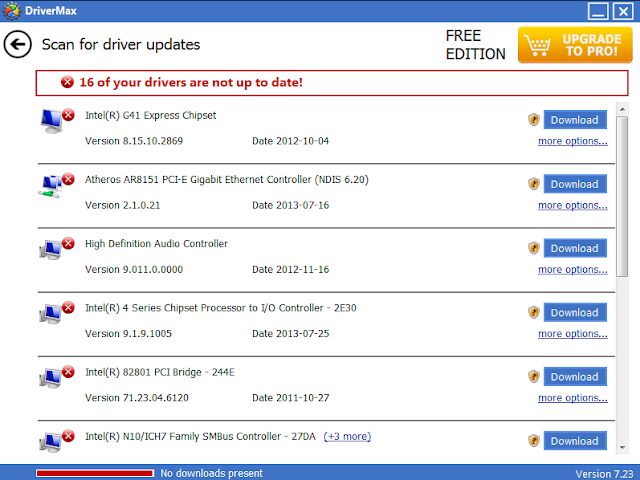 You can update all types of motherboard computer and hardware drivers. No need of searching drivers on the internet for unknown devices. You can customize the driver installations as in most situations Windows stores all versions of older drivers just in case you want to go back. The Export Wizard exports only the selected drivers by copying the needed files to a folder or a compressed ZIP file. Displays detailed report about all installed drivers such as version, release date, install date, etc. and provide you with Windows Experience Index rating information before you purchase new hardware. Windows 8 Compatibility and User-friendly Interface. DriverMax sits in the System Tray and informs you when there is a driver update. Finally, DriverMax is a great utility tool for updating your Windows drivers safely and can restore them when necessary. The application is easy to use and is considered as the best choice for all users. 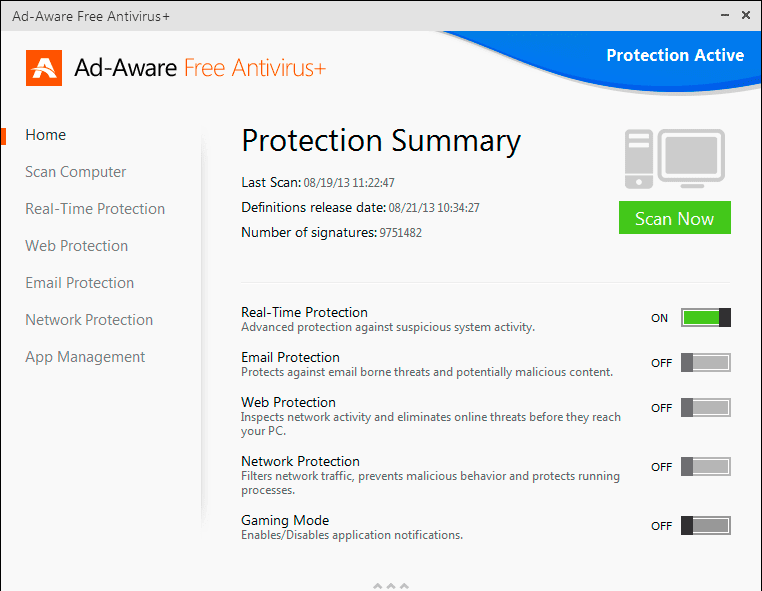 Ad-Aware Free Antivirus+ 11.0 is the latest freeware edition from Lavasoft, a security vendor which mainly focuses on spyware removal as well as providing basic antivirus protection for your PCs. It gives ultimate protection against spyware threats which come from world-wide-web. The core protection includes real-time antivirus, anti-spyware, rootkit protection, download protection, and of course web filters for safe internet browsing. Lavasoft’s pioneer technology provides traditional antivirus defense, along with comprehensive malware protection. Ad-Aware, in spite of facing few problems over the past 2-3 years, it had stick the basics and presented a full-fledged software for security. The new version answers to all the previous issues and queries it had faced. Though it can’t get to the top security list immediately, the overall improvement says that it can go much further if it continues to offer consistent online security. Let’s check out what features are included and improved in this latest version. Download and Installation made easy. Light and sleek user interface. Ad-Aware’s premium versions can be downloaded and/or unlocked easily. Superfast antivirus engine works alongside its powerful anti-spyware technology, to block malware, spyware and conventional viruses. Powered by BitDefender’s core security engine keeping ‘Vipre scanner’ aside. Automatic updates are available several times a day giving you the assurance of your computer’s security. The installation process takes extra time to download the virus definitions which is a bit bearable. The installation process is bundled with a bunch of disgusting unnecessary programs. But the in-house toolbar add-on would be useful and is recommended. The toolbar offers three basic features which include a built-in Yahoo! Search, a Web profile for safe browsing and a toolbar remover. Coming to its interface, Ad-Aware Free Antivirus 11.0 has got simple yet visually pleasing design with thinner fonts and modernized menu layout. Unlike other security softwares, Ad-Aware keeps away unnecessary social widgets from the interface, showing only basic modules. The other categories are neatly placed for quick navigation. Legendary Antispyware engine could detect and block cybercriminals from malware infection. A Superfast antivirus engine works along with the Ad-Aware antivirus engine to block malware, spyware and viruses. Real Time Protection can detect malware instantly before your PC gets vulnerable. It involves real-time process protection, registry protection and network protection. Download any internet stuff like photos, music, movies, P2P files, etc. with zero-risk. Advanced Two-way Firewall – Safeguards your personal identity and data against malicious programs. Safe Networking (HIPS technology) administers network and system activities and block malicious intrusions. Real Time protection for your Social Networking sites with the help of Anti-phishing technology. Malware Sandbox Emulator – A Virtual technology developed to protect users from unidentified or emerging malware without compromising system performance. Parental Control – Protects your children from all adult-related web content and activities by creating a custom website-filter pattern. Game Mode – Play games and watch movies without any disturbance as all security alerts, system scans and other notifications are turned off without compromising system security. File Shredder – Permanently remove all the data from your hard drive so that no one else can use your private information. Along with the above features, Ad-Aware Free Antivirus+ 11.0 also include few useful features such as Digital Lock, which protects your files and sensitive information with strong encryption technology; Pin-Point Scanning, to scan only the desired files or folders directly from their original location; Email Protection, which can detect email threats. Ad-Aware Free Antivirus+ 11.0 is a dependable choice if you are looking for basic antivirus features and powerful anti-spyware protection. This is a definite try if your system is infected with hard-to-remove malware. Advanced SystemCare 7 Free is the new freeware version that comes with lots of enhanced tools for PC optimization and cleaning. It is undoubtedly one of the most effective tools for system optimization in the current market which fixes all your PC problems with just one click. It repairs, protects and optimizes your computer with all sorts, with zero-error. And all this comes for free of charge. Like many other PC optimization tools, Advanced SystemCare 7 also bundled with huge number of tools for controlling your PC startup programs, defragmenting your hard drive, managing running programs, finding and removing duplicate files and tweaking essential Windows settings. 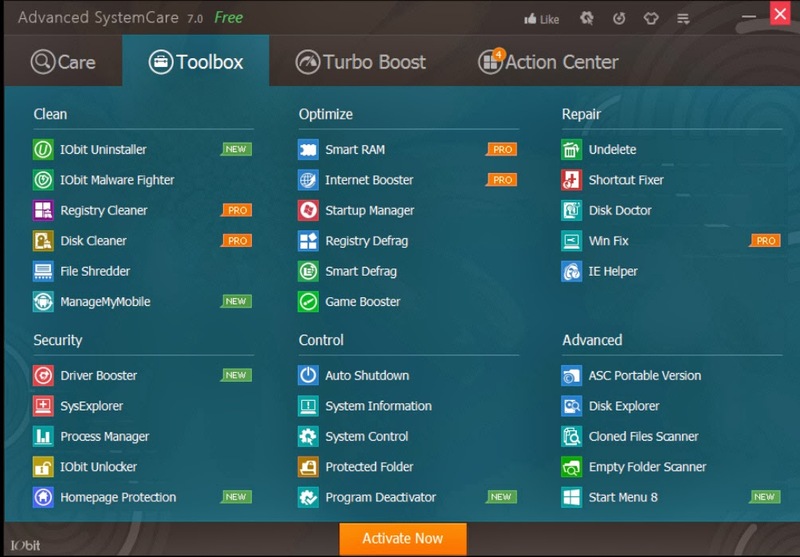 Advanced SystemCare 7 Free has huge list of new features such as brand-new Metro UI, Windows 8/8.1 support, Surfing Protection Technology, and many more. Check out below for the full list. 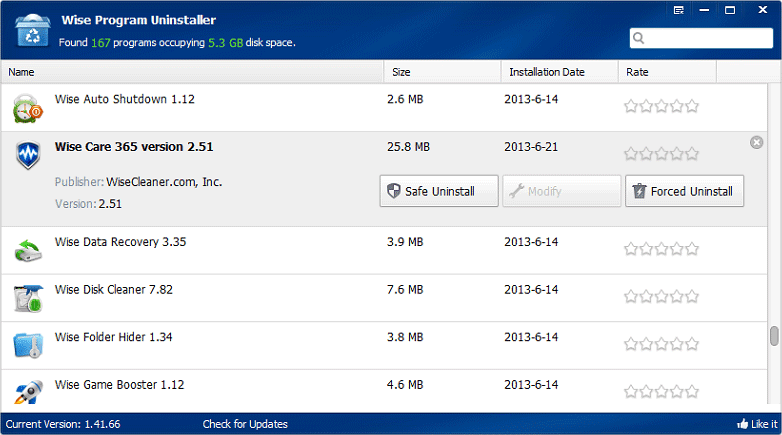 Uninstaller 3 – Improved Scan for both applications and browser plug-ins. Driver Booster – To update the outdated drivers quickly. Program Deactivator – Get more available system resources by automatically enabling and disabling background services. Real-time Protector – Protects your computer against malware in real time in the background. Homepage Protection – Protects your web browser’s homepage and search engine from malicious modification in real time. 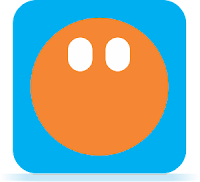 ManageMyMobile – Optimize, Clean, Manage, and Backup your Android device easily. Surfing Protection Technology – Support real-time database update and parental control for secure browsing. Start Menu 8 – Brings Windows 7 start menu for Windows 8 users. Skip-UAC Function – Loads your programs faster than ever. Expanded Malware Removal Database – To protect newly emerging malware threats from infecting your PC. Fully Upgraded Cloned Files Scanner – Support removing duplicates in just one click. 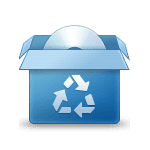 Junk File Clean – Cleans Windows 8 Metro App Cache to release more free system space and thus boosting the system performance. Privacy Sweep – Now Supports IE 11, Opera 16, Chrome 30, Twitter Metro, Adobe Reader Touch, Adobe Photoshop Lightroom 5.2, GOM Player, and more applications. Enhanced Registry and Vulnerability Fix – Higher Scanning speed and more solid performance. The new Metro-style design is more than the color change with minor font tweaks and icon modifications. Many of SystemCare’s tools are shortcuts to individual applications that are not shown rightfully. The installation is a bit tedious and annoying task which includes collection of shortcuts to other downloads. The toolbox suggests to install every single product separately instead as a whole. And the uninstallation too forces to uninstall each individual app separately. Advanced SystemCare 7 Free provides basic protection from security threats, basic system optimization, and block malicious attempts to access your personal data. It can improve gaming performance and undelete files which are removed accidentally. Also it can securely delete confidential documents that are vulnerable. It can restore the Start Menu to Windows 8, and many more. There are few cons for Advanced SystemCare 7 Free such as lackluster redesign, tedious install/uninstallation, basic defragmentation, basic malware protection, inefficient process explorers, etc. It is recommended to download separate tools for defrag and malware protection. As it is a free application, we can’t expect comprehensive protection or optimization. Apart from the above you can get great tools like Disk cleaner, Registry cleaner, Smart RAM, Internet Booster, and Win Fix that helps you to fix many system problems. To have a custom PC maintenance suite with plenty of useful functionality, Advanced SystemCare 7 Free is definitely worth a download. 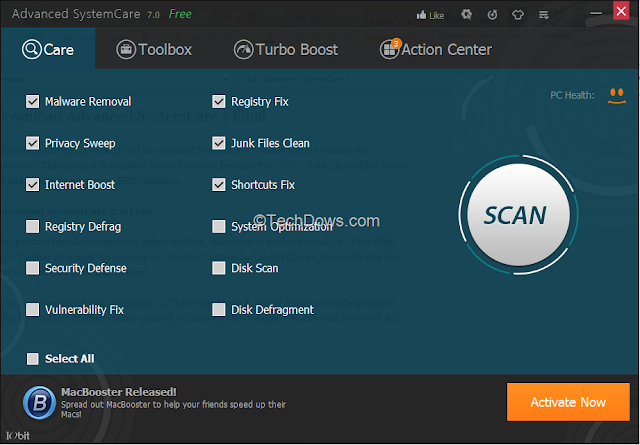 Download Advanced SystemCare 7 Free from IObit website. 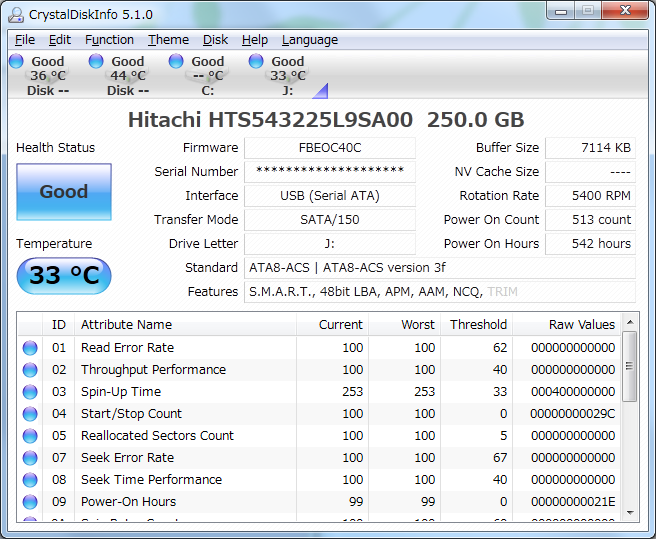 There are very rare tools that can possibly show the information of our hard disk drives (HDDs). CrystalDiskInfo is one of the system diagnostic tools which can be helpful in monitoring the health and status of your HDDs with easy-to-manage interface. 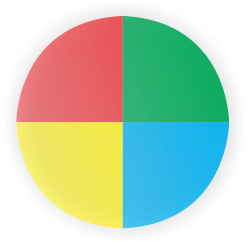 This is a free system utility that displays compact information as well as monitors S.M.A.R.T values, and disk temperature. It can even alert you when things go wrong. Serial ATA and IDE (Parallel ATA) disks connected internal ATA controller. Does not support RAID disks and IDE (Parallel ATA) and Serial ATA disks connected external ATA controller. Once you launch the application, CrystalDiskInfo instantly displays a list of details on your hard drive. The details include drive model name, disk size, firmware, serial number, interface type, transfer mode, drive letter, buffer size, NV cache size, rotation rate, power on count and on hours, and more. You can even view the health status and temperature of the drive, along with S.M.A.R.T information such as current, worst, threshold, and raw values. Shows General Information, Controller Information, and S.M.A.R.T information. Result of IDENTIFY DEVICE, SMART READ DATA, and SMART READ THRESHOLD commands. Patch tool to identify fail during NCQ write command. You can access “Disk Management”, to create a simple, organize disk conversion options, as well as extend and shrink partitions. You can run CrystalDiskInfo at startup, enable advanced disk search, change preferred language, and change the font. It consumes very less amount of system resources. Finally, CrystalDiskInfo is a must-have system diagnostic utility for every PC user to monitor the health status of HDDs. Download the latest version CrystalDiskInfo 6.0 for free which supports Windows 8.1, 8, 7, Vista, XP, Server 2008, 2003, and 2000. When surfing the internet, you might come across great quotes from famous personalities, articles excerpts, blog postings, research data, interesting facts, or your own thoughts and ideas. You copy this information to Notepad, MS Word or WordPad. You may wish to gather all this information, organize and retrieve them whenever needed, using a notetaking program. 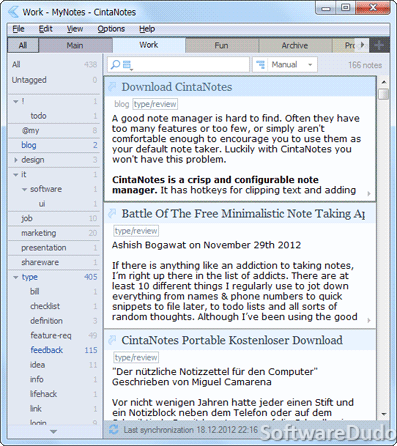 CintaNotes is a free, lightweight and user-friendly notetaking program for Windows, used especially for saving and tagging any useful information that you come across or just need to jot down. 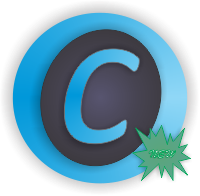 CintaNotes is a simple yet powerful application with an intuitive interface. A small form is used to note down the important information. The note preserves a title, a tag, and set of links to online resources. The note(s) can be customized with the help of available features. You may select one of the emphasis options such as bold, italic, underline, strikeout. You can highlight the important areas and create bullet or numbered lists. You could also insert timestamps to the notes. Once completed, the list of created notes is listed in the app’s interface with creation time and date. You can customize each note such that it is under a different section, which makes it easy to differentiate between important and not so important notes. The new version 2.3 has added a new feature for search option “Search across field boundaries” and added confirmation dialog to merge command. It has improved some features such as hyperlink support, editor, and simplenote sync. And also fixed some of its features related to recycle bin, Esc key handling, HTML export, editor, CN crash, valid license, and imported tags are not assigned. A free, lightweight and user-friendly note taking application that saves and tag any useful information. Clip text from anywhere by pressing the hotkey using text-clipping that automatically saves the text and its source URL without installing a browser plug-in or add-on. Retrieves information as soon as you start typing the title or the URL. Organize note information with powerful tagging system and later use tag union, intersection and subtraction filters to quickly find what you need. Simplenote Synchronization (PRO version only) – You can get full read/write access to your notes on any iOS, Android or Windows Phone device. Synchronize notes across multiple PCs with Live note synchronization via free online services such as Google Drive, DropBox, SugarSync. Also comes as a portable version, which you can carry on a flash drive and run it directly on any computer without installing. CintaNotes is also available in PRO version that includes advanced features like multiple notebooks, unlimited number of tabbed sections, expandable tag tree, exporting notes to HTML, pasting notes into other applications, and accessing notes from mobile devices. The PRO version license can be purchased for $25 which includes 12 months of free updates and zero adware. Coming to its free version, it has some limitations like it can create only up to 3 sections, simplenote sync is disabled, and cannot link notes with each other. Although it has some restrictions, the free version definitely proves to be useful on a daily basis. Any inexperienced individual will find it useful and easy to handle. 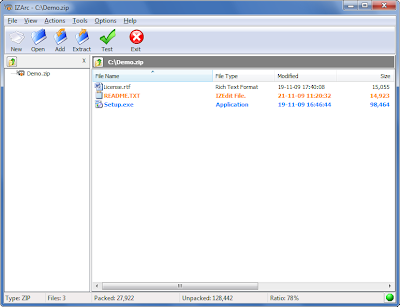 Download CinteNotes installer or portable versions for free from below link. Norton Internet Security 2014 is the latest edition of the internet security suite from Symantec (Norton). Its power-packed features make it one of the most effective internet security suites available in the market. It offers complete online security as well as protecting your child’s safety with parental control feature – Norton Family. It offers protection from online threats, social media scams, network invaders, viruses, malware, spyware and spam. Besides providing you complete online safety, your PC’s performance will not be compromised; moreover it boosts performance and stability. 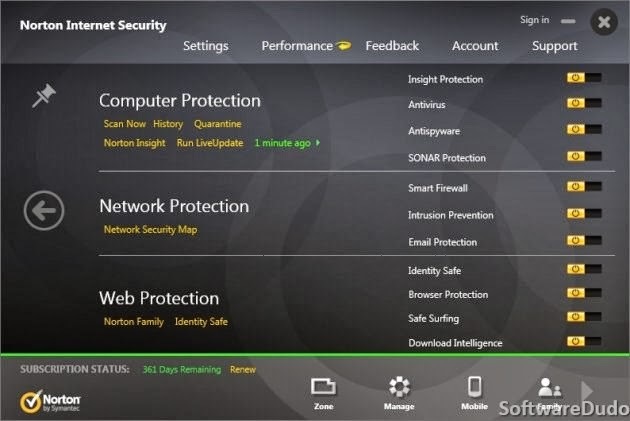 Norton Internet Security 2014 has an excellent blocking mechanism for malicious and deceitful websites, strong parental controls, network map monitoring on Norton installations, improved startup manager, accurate spam filtering and intelligent firewall. It shows minimal impact on system performance. If you want to utilize parental control feature comprehensively, then you should purchase it and that’s one of the main drawbacks in Norton Internet Security 2014. Other limitations include 30 days trial version with nag screen. Threat-removal Layer – Eliminates difficult-to-remove threats completely from your computer. Norton Protection System includes 4 layers of solid protection especially designed to proactively against the newly emerging threats. Identity Safe – Remembers, secures and automatically fills your website user credentials of you, so they can’t be lost or stolen. Safe Web for Facebook – Checks your Facebook for malicious links, infected downloads and risky websites. Automatically sends you the significant product and feature updates and installs the latest version without your involvement. A pre-installation scan is performed before installing the actual product in Norton Internet Security 2014 version, because an unprotected machine has threats that would disable antivirus. Pre-installation scan detects basic malware and eliminates them perfectly, while it has difficulty in removing rootkits or MBR infections during pre-installation. Whereas, the actual installation of the product goes smoothly with no computer restart once it is done. Coming to its Interface, the minor changes made are effective, while the rest of the things remain same. As it compatible with Windows 8 OS, the touch-enabled systems feel more comfortable in accessing the interface. Norton Insight, identifies which files are safe and dangerous using the feedback of Norton user community. Anti-phishing – This technology blocks fraudulent “phishing” websites that tries you steal your personal information. Intelligent 2-way Firewall – Prevents anonymous access to your home network by blocking incoming traffic concluded to be unsafe. 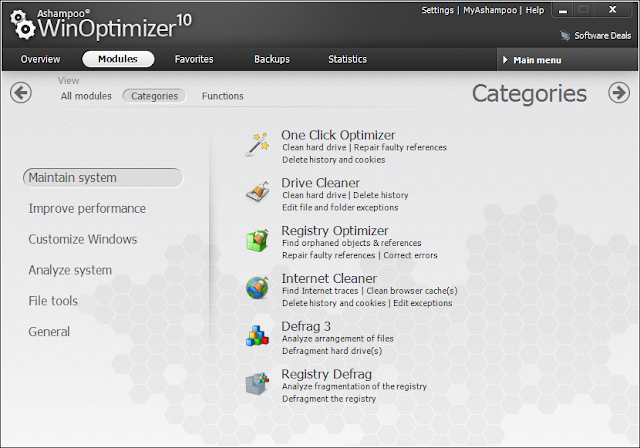 Defrag – Resolves your PC’s frequent problems that can slow down the performance and battery life. Built-in Intelligence – Increases your Laptop’s battery life by killing unnecessary services until you are plugged in and out of full-screen mode. 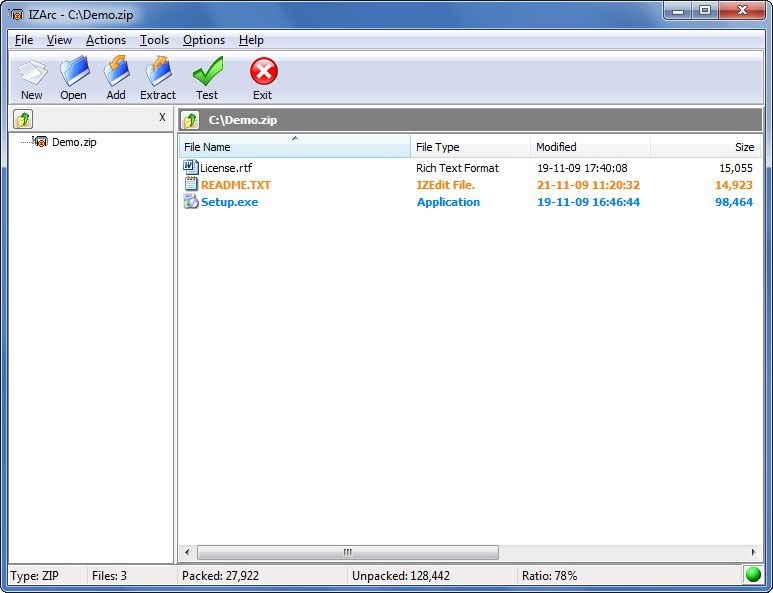 Insight + Optimized File Copy – Finds safe files and only scans unknown files. Spam Blocking – Removes unwanted, malicious and deceitful emails from your mailbox. Norton Family – This parental control feature protects your kids from online hazards. Startup Manager – Frees up your PC memory so as to computer startup faster. There are more useful tools such Scam Insight, a Password Manager/Form Filler, Network Monitor, Bootable Repair Disc, and other performance-related tools. The Password Manage now supports drag and drop facility that you can search for logins directly from the toolbar. The interface is more obtrusive than the previous one. The improved behavioral detection protects you from never-before-seen threats. In the list of top internet security softwares, Norton Internet Security 2014 doesn’t stand in the competition, although it is highly-efficient in providing online security and minimal impact on PC performance. Download Norton Internet Security 2014 30-day trial or purchase full version for Windows 8, 7, Vista and XP operating systems. 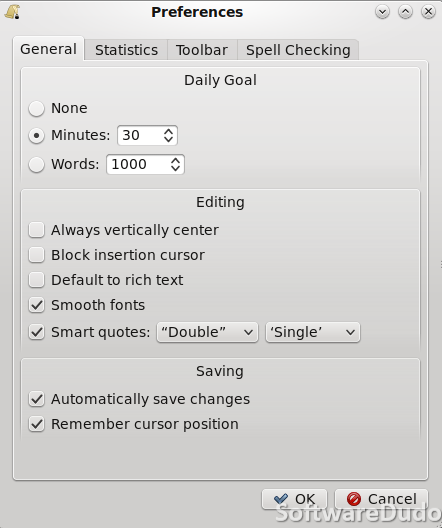 FocusWriter is a highly capable and easy to use a Fullscreen word processor with uncomplicated, distraction-free writing experience. It uses a hide-away interface that you access by moving your mouse pointer to the edges of the screen, letting the program have a familiar look and feel to it. The hide-away interface allows you to immerse yourself in your work completely. 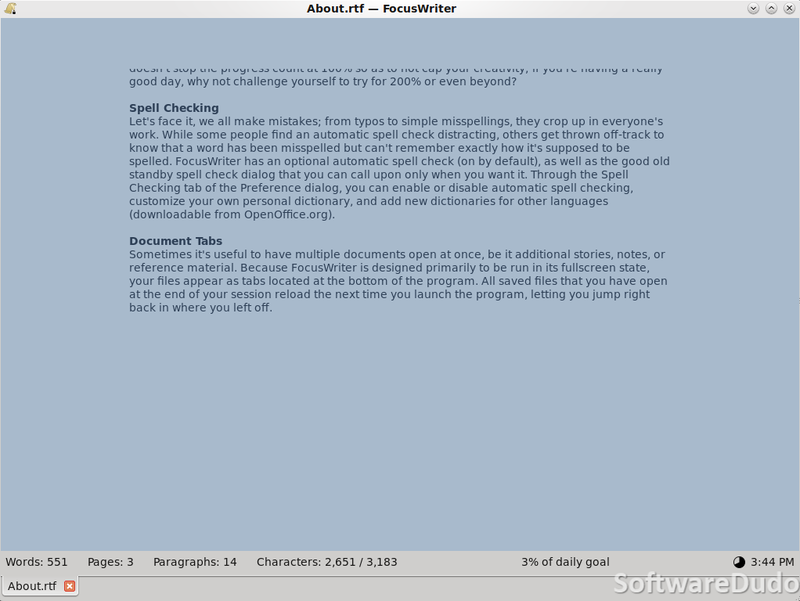 FocusWriter is available for Windows, Mac OS X and Linux operating systems, and has been translated into many different languages. 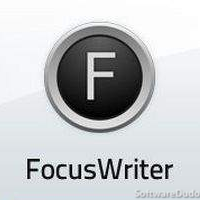 FocusWriter 1.4.4 is the latest version that has added Indonesian translation by Eka Y Saputra and fixed few bugs. The specialty of FocusWriter is its full-screen view and hide-away interface, that improves focus on work and increase productivity. 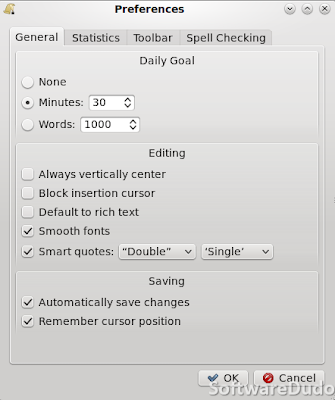 Other significant features like Autosave, Goal-tracking, Formatting, Spell Checker, and Find & Replace too have made FocusWriter a different word-processor altogether. Using FocusWriter, you can write several documents or take simple notes without being distracted by the interface. The interface is simple to use where the users have the possibility of adding and managing files via the File menu. Word-processing giant, Microsoft Word dominated for many years, but there are some good alternatives like FocusWriter which encourages focus and productivity, making it a versatile word processor. FocusWriter comes as both installer and Portable version, where you copy on a USB drive and run it on any compatible Windows PC. It supports Windows 8, 7, Vista, XP and 2000 OS versions. AVG Antivirus Free 2014 is the newest version from AVG (Anti-Virus Guard) Technologies. It delivers excellent protection against malware attacks and offers secure search and secure file shredder. 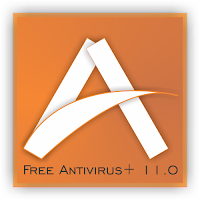 It is quick and accurate antivirus tool which provides high-quality antivirus features for free. It personates your online and offline information, keeping away from intruders and thus prevents spying and data theft. The new Secure File Shredder leaves no traces of deleted files behind. It improves your PC performance and helps to run smoothly. As AVG Antivirus Free 2014 a free edition, you can get only basic protection for surfing, searching and social networking. For regular online activities, the free edition is more than enough. The latest version 2014 v14.0.4142 has laid big importance on privacy when you are surfing the internet. The new File Shredder permanently deletes files that can’t be accessed or recovered again. It ensures that your personal information is kept safe and private. User-friendly interface provides easy access to AVG’s free mobile apps. The detection rates are improved to guarantee that your personal data doesn’t get into the hands of cybercriminals. AVG did not remove the toolbar in AVG Antivirus Free 2014, as the users are annoyed with browser toolbars and they want a clean browsing experience. 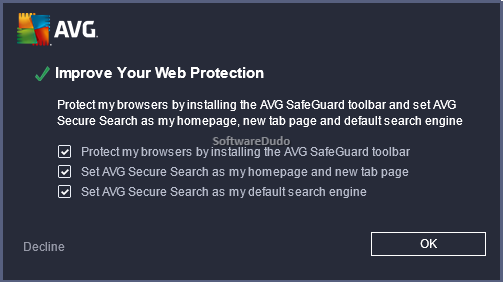 But, AVG’s toolbar has the valuable security option – Do Not Track, which is also available as a free standalone add-on on Firefox and Chrome. So, users can download it separately from their respective stores. The installation time still remains the same as of AVG 2013. Coming to its interface, AVG has made minimal changes to the 2014 edition, keeping the rest of the things similar. Anti-virus engine detects, blocks and removes viruses and spyware. It prevents online spying and data theft. File Shredder – Deletes your data permanently that cannot be accessed or recovered. It improves your PC performance and speed and helps your system run smoothly than before. LinkScanner – Smart prevention technology that blocks suspicious sites by checking every web page before you visit. Social Networking Protection – Checks the links that get exchanged when using Facebook, Twitter and other social networking sites. Do Not Track – Comes with AVG Security Toolbar that lets you identify which websites are gathering your online activity information and prevent them if suspicious. Turbo Scan – Improves scanning process and increases speed. 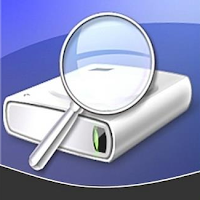 Smart Scanner – Scans only when your PC is idle i.e. on low priority mode. The files that are already scanned are ignored to reduce scan times. Considering AVG Antivirus Free 2014 a free version, it provides solid PC protection with basic security features yet robust, which are not present in most freeware security softwares. 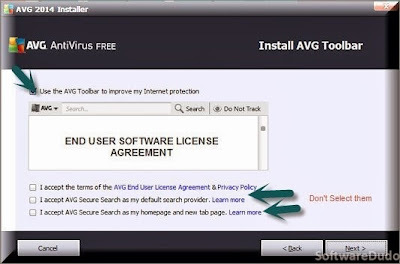 Download AVG Antivirus Free 2014 for free from its official website. Kaspersky’s latest version of internet security comes with quality computer protection from all existing and emerging internet threats, ensuring you are secure at all times. Internet-specific transactions performed via online banks, PayPal, and e-commerce sites are even safe as it offers exclusive tools such as Safe Money and Secure Keyboard. Because, the growth in web-based activities have also led to growth in internet security risks concerning your personal information. 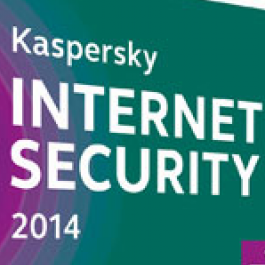 Kaspersky Internet Security 2014 is optimized for high performance so that you can use the internet at its peak. Kaspersky Internet Security 2014 delivers powerful security and offers a hassle-free computing experience. The cloud-based Kaspersky Security Network collects data related to new, emerging and unknown threats from millions of participating users' systems around the world, to safeguard your PC from the latest viruses and malware attacks. Potential internet threats are supervised and analyzed in real-time and are blocked away totally before they infect your computer. Trusted Applications mode, which allows only reliable applications to run. Screen-locker protection that detects and removes the threat of screen-unlocking. ZETA Shield, an in-house built protection technology to block Zero-day Exploit and Targeted Attacks. Improved Windows 8 performance optimization, GUI speed, and low resource consumption. The Installation process takes less time than its predecessors, but compared to Norton, AVG and Avast, it consumes a bit more time. A restart may be required in some cases depending upon the user system configuration. Kaspersky Internet Security 2014’s design made nominal changes to its GUI. It has been much cleaner, uncluttered look compared to the Kaspersky 2013 version. Windows 8-like buttons are placed to support touch-enabled systems. Anti-virus and anti-malware engines protect your PC against all computer viruses, worms, Trojans, spyware, rootkits, bots and many more. Cloud-based protection – Delivers a quick response when an emerging threat is found. It uses the cloud-based Kaspersky Security Network (KSN) to collect information about new malware threats from millions of PC users. Automatic Exploit Prevention – Controls vulnerable files from running, analyze them and restricts applications that include malicious codes. System Watcher – Detects dangerous behavior on your PC and enables you to undo or roll back all types of malicious action. Optimized Antivirus Databases – Minimal impact on PC’s performance and reduced installation and update time. URL Advisor – Uses cloud-based data about the reputation of websites to notify you about trusted, suspicious links or dangerous sites. Anti-phishing and Anti-spam Protection – Updates database regularly to defend you against internet hacker’s attempts which access your personal information. 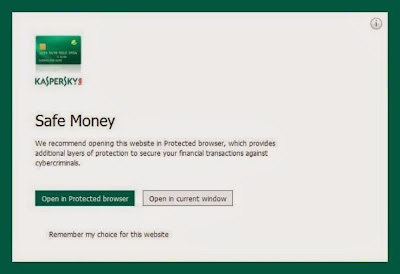 Safe Money – Protects your money when you are banking or shopping online. Secure Keyboard and Virtual Keyboard – Protects your data from keyloggers. Improved GUI, Streamlined settings, Redesigned and revised scan features, Optimized for Windows 8, Low consumption of PC resources and Less Battery Consumption. Improved Parental Controls – Controls for Internet Usage and Social Networking; Prevent the sharing of private data; Predefined User Profiles; Game ratings based on the child’s age, game type and content. There are different scan types – Full, Critical, Vulnerability and Custom scan. “Safe Money” feature allows you to add bank or payment system website and relevant description. You can run that particular website in a protected browser, prompt for action, or do not run the protected browser. There are a few useful tools from Kaspersky Internet Security 2014 like Vulnerability Scan, Kaspersky Rescue Disk, Windows Troubleshooting, Privacy Cleaner, and Browser Configuration. With Kaspersky Rescue Disk, you can create a bootable CD or USB flash drive containing a set of tools for efficiently detecting and eliminating computer infections. You can either download ISO image form Kaspersky Lab server or copy ISO image from local or network drive. Summing up everything, we can say that Kaspersky Internet Security 2014 is an excellent choice for regular internet users that protects you from online malware and phishing attacks. Parental Control and Application Virtualization are the additional things it offers. You can download Kaspersky Internet Security 2014 30-day trial version or purchase the full version for $60. It is supported in Windows 8, 7, Vista and XP operating systems.